Now that we've discussed tangents and limits, (see "What's a Tangent?" and/or "The Y's the Limit" on this site in Math Maven Musings) we can investigate the derivative. Differentiation first appeared on the mathematical horizon when Isaac Newton and his mathematical buddies were seeking a way to find an expression and/or a value for the slope of the tangent to any curve at any point on that curve. They realized that the ability to evaluate the slope of the curve at any point would allow them to determine where the curve was increasing, decreasing, at a max or min value without actually analyzing the curve's function. What we need to do is make the 2 points of intersection into a single point. We do this by limiting h, (the horizontal distance between the two points) to zero -- since it is distance h which causes the points to be different and discrete. When we take the limit from the right as h approaches 0 + , for the slope fraction above, we're moving point B into point A, so we're finding the slope of the tangent to y = f (x) at point A. 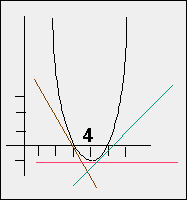 If we collapse the horizontal interval by moving point A towards point B, as shown, taking the limit from the left (limit h approaches 0  ), we get the slope of the tangent at point B. This says that the slope of the tangent at any point of contact will be twice the x coordinate of the point minus 8. So the slope of the tangent to this curve at P(  3, 48) is 2(  3)  8 = 14. Let's look at an image of our parabola to investigate what this expression says about the slopes of the tangents to the curve. Keep in mind that the tangent line is just the surfboard riding the curve of the wave and the derivative is the slope of that board. are > 4. All tangent slopes are now positive since the lines all rise to the right. 1) on intervals where the derivative > 0, f (x) is increasing. 2) on intervals where the derivative < 0, f (x) is decreasing. 3) points which make the derivative = 0 are critical points -- either a max, a min or a point of inflection.